Thomas was a close friend and disciple of Jesus while he lived, but this practical man simply did not believe the other apostles when they said that Jesus was risen from the dead. 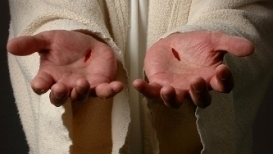 Jesus appeared to him and showed him the wounds left by the nails and the spear. 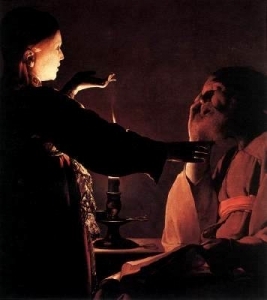 ‘Now do you believe?’ asked Jesus. In the days after the Resurrection, there was a great deal of arguing and counter-arguing, of rumour and counter-rumour. 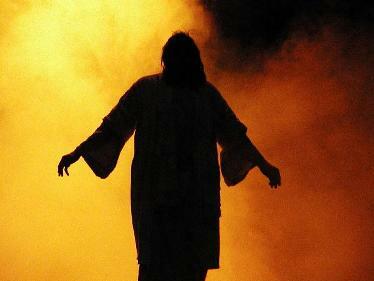 A number of the disciples were convinced that Jesus was risen; there were probably many who scoffed at the idea. It simply was not possible, they would have argued. Among the scoffers was Thomas, presumably present at the Last Supper, possibly watching from afar when Jesus was crucified, and until this fatal week in Jerusalem a faithful follower of Jesus. But he had missed a pivotal moment: he was not present when Jesus appeared to the other disciples on the evening of Easter Sunday. He had not seen, as they had, the living Jesus. He seems to have been a sensible, down-to-earth man, not given to rash judgements. Now he found it impossible to believe what many of the other disciples were believing: that Jesus had risen from the dead, and was alive and among them. He was not given to hiding his opinion: he expressed it freely. He would believe, he said, when he has actually put his hand into the horrible wounds that were left by the nails and the spear, when Jesus was crucified. He wanted physical evidence to show that the risen Jesus was the same Jesus he had known. 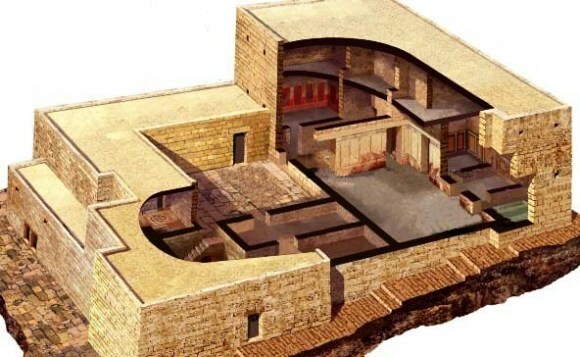 A week later the disciples, including Thomas, were gathered in a house – we do not know where. The doors of the house were locked – the disciples were still afraid. But suddenly Jesus was among them. This in itself was astonishing, and seems, like the other appearances of Jesus, to suggest that Jesus’ resurrected body was not governed by the normal laws of Nature. Jesus’ first words were ‘Peace be with you’ – a traditional greeting, but perhaps also a sort of ‘Steady on, chaps’ to the disciples, who would have been alarmed and dis-oriented by his sudden appearance among them. 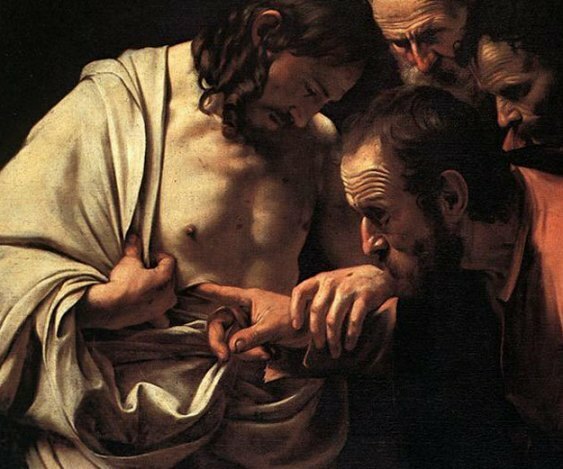 Jesus then turned to Thomas, and told him to place his fingers in the nail wounds in his hands. 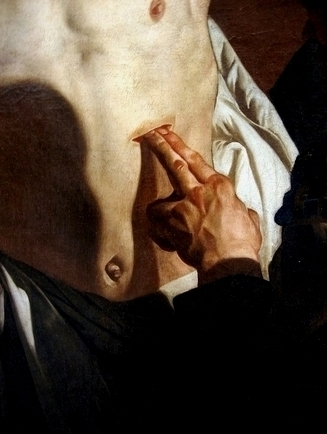 He told Thomas to place his hand in the gaping wound in his side, where the soldier’s spear had pierced. In doing so, he showed Thomas that he somehow knew what Thomas had been saying. Notice Thomas’ response: he calls Jesus not only Lord, but names him God as well. There was a gentle reproach in Jesus’ response: Thomas believed because he saw with his own eyes that it was Jesus, risen from the dead. How much more blessed were people who never saw Jesus, never heard his voice, but believed in him as Lord and God. This has applied to all believing Christians since the time of Jesus.